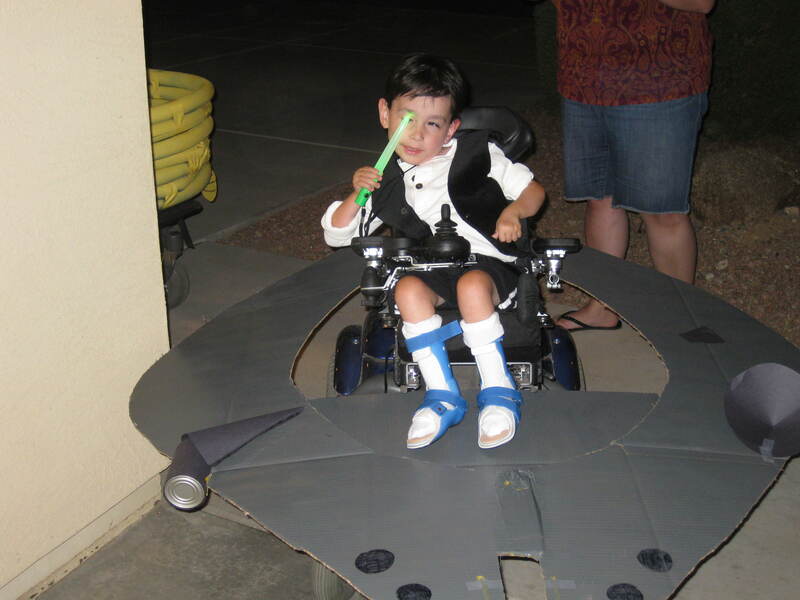 You are here: Home / Everyday Posts / But the wheelchair IS the costume! But the wheelchair IS the costume! I mentioned in my post last week that the twins were obsessed with dressing as a bumblebee and as Han Solo for Halloween tonight. I was on board with Lauren’s bumblebee costume, as I’d invested a solid eight bucks in her antennae, stinger, wings, and bow tie (bees dress up formal down here in the desert southwest, yo). 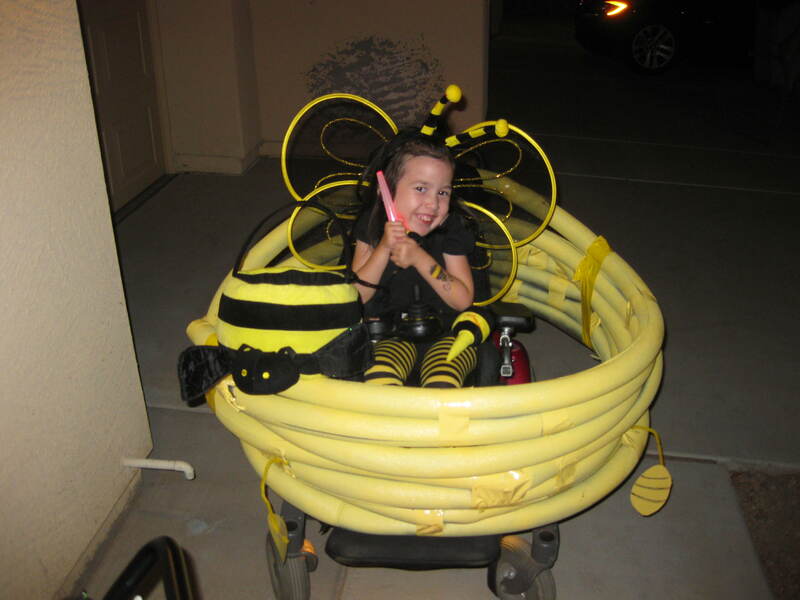 Her bee hive was epic, and while not particularly welcomed in driveways with cars parked in them (we call those kinds of houses on Halloween “inaccessible”), her hive otherwise hit it outta the park and made for some great Halloween photo ops! Hint: if you give her a Milky Way, she will agree to not sting you. But Han Solo? Really? Now what exactly does that costume entail? Honey, can you put the VHS tape in and fast forward to the parts with Harrison Ford? Our good friend Marie fashioned a Millennium Falcon for him, but it was assumed it would be no big deal to find a white, long-sleeved shirt and black vest to complete the look. [[Insert my well-practiced-and-exaggerated look of consternation.]] These are items that sound basic, yet are not easy to find. I’ll spare you the details of how I eventually found the required components of his costume, but I think we can all agree that the only one who can rock a black vest and a space ship more than this kid is Harrison Ford himself. As for the candy last night, may the treats involving chocolate rest in peace in my tummy. Items not involving chocolate are quite comfortable in my trash can. Let that be a lesson to you, neighbors who favor simple sugars but won’t pay enough for the chocolate.